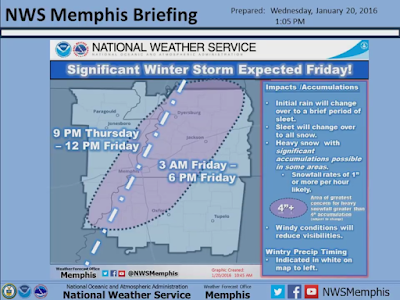 With the relatively minor (for most) winter event this morning now in the rearview mirror, we turn our attention to the next one, which has the potential to pack a punch and be much more of an impact to the Mid-South. As we did yesterday here on the blog, we'll start with the overview and then get into the nitty-gritty details. 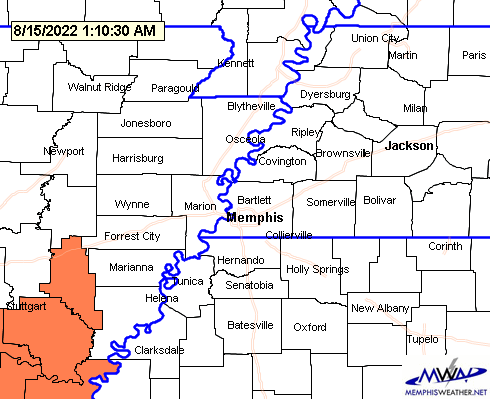 Map of current watches/warnings/advisories in effect for the Mid-South. Watches/Warnings/Advisories: Winter Storm Watch from midnight to 6pm Friday. How much: Minor sleet accumulation (1/4") as rain transitions to snow, then periods of heavy snow possible through early afternoon. Exact snow amounts uncertain, but as much as 2-6" is likely somewhere close to the metro. Possible Impacts: Significant. Possibly heavy snow coupled with north wind gusts to 30-40 mph and temperatures falling into the 20s on Friday could result in areas with power outages and treacherous travel. Wind chills will drop as low as 10-15° on Friday. Confidence: Moderate-High. Details on exactly where heavy snow will set up is the biggest question mark, but it is likely that the entire metro will have significant impacts nonetheless. Computer model data has begun to coalesce around a common solution as far as the big picture for Friday with minor details still to be hammered out. There is enough consensus, however, to have moderate to high confidence in an impactful event affecting the entire metro starting early Friday and continuing through the day. The main concerns are snow accumulation and strong wind, which will likely produce hazardous to treacherous travel conditions, possible power outages, and very cold wind chills. 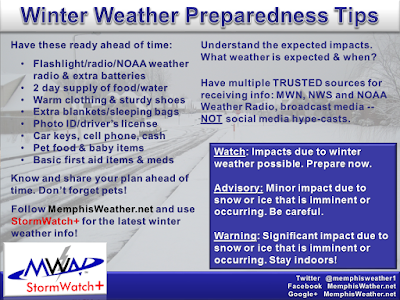 NWS-Memphis briefing graphic with their thoughts on the storm. Click for larger image. Low pressure will develop over southern AR Thursday, strengthening rapidly as it moves across north MS overnight. Computer models now have decent agreement on the track and strength of the low, with minor variances. Rain will occur on Thursday with temperatures above freezing, but perhaps not much above 40°. Rain continues Thursday night with temperatures falling through the 30s and wind increasing as the low moves across north MS.
By early Friday morning (4-8am most likely), temperatures will be cold enough for rain to transition, perhaps briefly to sleet, then to snow. Periods of heavy snow are possible Friday morning as the low moves into north AL. Strong northerly wind on the backside of the departing low will result in temperatures continuing to slowly fall into the upper 20s by mid-day. Wind gusts of 30-40 mph are conceivable due to the strength of the low, which will move east to become a Nor'Easter (that the national media is quickly catching onto) and will produce up to a couple of feet of snow in portions of the Northeast U.S. The key to knowing where the heaviest snow will fall lies in where the deformation zone behind the departing low pressure develops. A deformation zone is basically an area around the north to northwest side of a mature low pressure system where warm, moist air that rises and wraps around the low in a counter-clockwise fashion meets cold air being drawn into the system from the north. Deformation zones produce an area of heavy snow and there tends to be a sharp cut-off to snowfall amounts on the edge of this zone. The prediction of exactly where that deformation zone sets up and where the snow cut-off lies is nearly impossible more than a day in advance of the event. However, I have fairly high confidence that at least parts of the metro will receive heavy snow on Friday and that there will be enough snow for all to result in significant impacts (we are in the south after all). 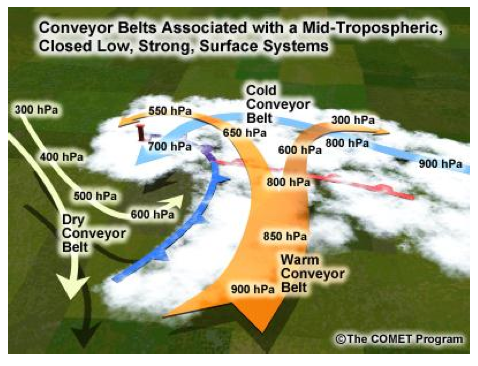 The deformation zone is the area on the back side (left) of the low pressure area ("L" in upper left) where warm moist air wraps around into the cold air zone around the low, producing an axis of heavy snowfall. Graphic courtesy COMET. Is there bust potential? Yes, but missing out on any snow is not likely. The confidence in snow actually occurring is almost certain. The forecast will be refined and changed over the next 36 hours. 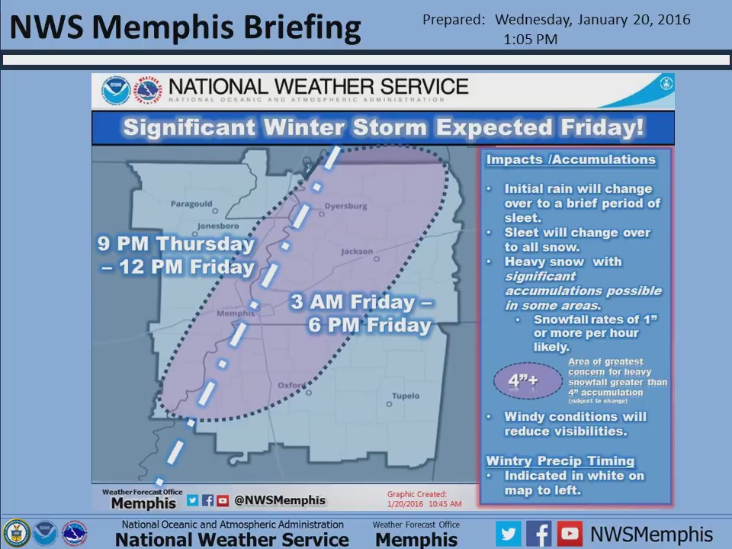 Nothing is certain until it happens, but we expect it will be the details that change, not the fact that the event will be significant for the Memphis area and result in major challenges to travel and commerce on Friday. What should we do now? First, stay in touch. We'll provide the latest information as we get it and address any changes to the forecast. Read and follow the tips below, since power outages are possible. If you have travel planned in the region Friday, postpone or cancel it if possible. 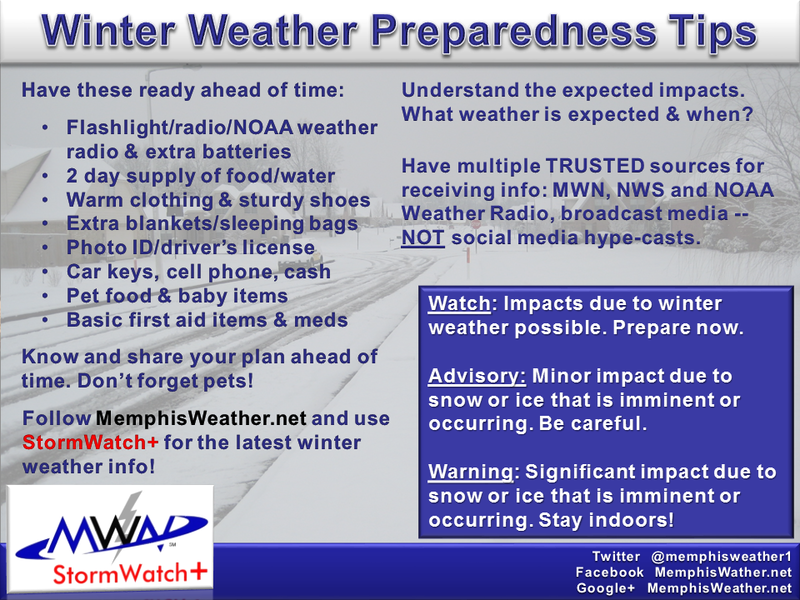 Winter Weather Preparedness Tips. Click for larger image. Looking ahead, a dry weekend is in store, but it will continue to be cold Saturday (probably in the 30s) with a warming trend as we head into Sunday and Monday. Nice work brother! Hope you are well.